Improved survival in children with critical illnesses has led to new disease patterns. As a consequence evaluation of the well being of survivors of Pediatric Intensive Care Units (PICU) has become important. Outcome assessment should therefore consist of evaluation of morbidity, functional health and Health Related Quality of Life (HRQoL). Awareness of HRQoL consequences and physical sequelae could lead to changes in support during the acute phase and thereafter. The aim of this study was to evaluate HRQoL in PICU survivors. Prospective follow-up study three and nine months after discharge from a 14-bed tertiary PICU. Eighty-one of 142 eligible, previously healthy children were included from December 2002 through October 2005. HRQoL was assessed with the TNO-AZL Preschool Children Quality of Life Questionnaire (TAPQOL-PF) for children aged 1 to 6 years of age, the TNO-AZL Children's Quality of Life Questionnaire Parent Form (TACQOL-PF) for children aged 6 to 12 years of age, and the TNO-AZL Children's Quality of Life Questionnaire Child Form (TACQOL-CF) for children aged 8 to 15 years of age. The studied patients were compared with age appropriate normative data using non-parametric tests and effect sizes. Thirty-one and 27 children, and 55 and 50 parents completed questionnaires respectively three and nine months after discharge. In 1–6 year old children parents reported more lung problems (3 and 9 months), worse liveliness (9 months) and better appetite and problem behaviour (3 months); in 6–12 year old children parents reported worse motor functioning (3 months); and 12–15 year old adolescents reported worse motor functioning (3 months). Large effect sizes indicating clinical significant differences in HRQoL with healthy control subjects were found on more domains. In this small group of PICU survivors differences in HRQoL with the normative population exist three and nine months after discharge. Calculated effect sizes were smaller nine months after discharge. These changes suggest that HRQoL improves over time. More research is necessary but we believe that HRQoL assessment should be incorporated in follow-up programs of PICU survivors. Although physical and psychological sequelae have been described, studies focusing on HRQoL in PICU survivors are scarce. [12–17] The Health Utilities Index (HUI) 2 is used in five studies to evaluate functional health. In three studies ± 30% of PICU survivors were in full health, one year after discharge. [18–20] In the Australian and Swiss studies using the HUI 2, ± 80% of the survivors were scored as having good quality of life one year after PICU discharge. [21, 22] The HUI 2 evaluates only six domains of HRQoL: sensation, mobility, emotion, cognition, self-care and pain. Evaluation is done by the parents and not the children themselves when older than eight years of age. In another Australian study the Royal Alexandra Hospital for Children (RAHC) Measure of Function-Clinical Rating Scale was used to evaluate QoL: 60% of survivors had normal QoL, 3 to 24 months after discharge. Evaluation is done by the primary physician. In all studies loss of follow-up is substantial and selection bias is possible. No studies exist, evaluating changes over time in HRQoL. The aim of our study was to evaluate HRQoL in previously healthy children that were unexpectedly admitted to the PICU at two time points (three and nine months) after discharge and to evaluate whether HRQoL changes over time. Evaluation was done at the out-patient follow-up clinic by validated questionnaires completed by parents of children younger than 8 years of age and by children themselves when 8 years of age or older. We hypothesized that HRQoL is decreased after PICU discharge and improves over time. This study was part of an on-going explorative research program on physical and psychological sequelae and consequences for QoL in children and their parents after an acute and unexpected PICU admission. The PICU of the Emma Children's Hospital/Academic Medical Center Amsterdam is a tertiary PICU with 14 beds admitting patients from the greater Amsterdam area. Medical, surgical and trauma patients and patients from all pediatric subspecialties are admitted. In this study we only wanted to include previously healthy children that were unexpectedly admitted to the PICU with a serious illness, for instance respiratory and circulatory insufficiency due to respiratory syncitial virus (RSV) infection or meningococcal disease, and all trauma patients. Furthermore children admitted for respiratory insufficiency necessitating ventilatory support for at least 24 hours and children admitted to the PICU for at least 7 days were included. We excluded children with known underlying illnesses or patients with scheduled elective surgery; admission due to abuse or self-intoxication and the inability to complete Dutch questionnaires because of a language barrier. The study was done from December 2002 through October 2005. After discharge from the PICU, each family received a letter explaining the aim and content of the research program. Families were contacted by telephone to enhance participation. For cases lacking telephone contact, follow-up letters with tear-off reply slips inviting participation were sent. Written informed consent was obtained from all participating families. The Medical Ethic Committee of the Academic Medical Centre in Amsterdam has approved the study protocol. Three and nine months after discharge QoL questionnaires were sent to all families with a reply envelope. All families were invited to visit the outpatient follow-up clinic three months after discharge for structured medical and psychological examination of the child by a pediatric intensivist and a psychologist. HRQoL was assessed with the TNO-AZL Preschool Children Quality of Life Questionnaire (TAPQOL-PF) for children aged 1 to 6 years of age, the TNO-AZL Children's Quality of Life Questionnaire Parent Form (TACQOL-PF) for children aged 6 to 12 years of age, and the TNO-AZL Children's Quality of Life Questionnaire Child Form (TACQOL-CF) for children aged 8 to 15 years of age. [24–31] These questionnaires are generic Dutch instruments that measure health status problems weighted by the impact of the health status problems on well being. It offers the respondent the possibility of differentiating between their functioning and the way they feel about it. Most of the items consist of two questions linked to another. On the first one, the respondent can rate on a three point scale, (never, occasionally, or often), whether or not a specific problem occurred in the past few weeks. If a problem occurred, the child can indicate how it felt about this problem on a four point Likert scale: (very) good (3) – not so well (2) – rather bad (1) – bad (0). Numbers between brackets refer to the values resulting in the HRQoL scores. (Figure 1) The items are clustered into multi-item scales; scale scores are calculated by adding up item scores within scales, with higher scores indicating better QoL. For the TAPQOL-PF crude scales scores are transformed linearly to a 0–100 scale; for the TACQOL-PF and TACQOL-CF maximum domain scores are 16 for the emotional scales and 32 for the other scales. In the calculation of the scale scores one or two missing combined-item scores are allowed for. They are replaced by the mean value of the non-missing (combined) item scores. For respondents with more missing combined item scores per scale, the scale is assumed to be missing. Normative data from the general Dutch population are available. The instruments measure HRQoL on a group level in a reliable and valid way. Reliability (Cronbach's alpha) in the general populations are moderate to good (0.59–0.84) for all scales in all questionnaires, except for 'stomach functioning' and 'motor functioning' in the TAPQOL-PF. Criterion validity is good for all scales in all questionnaires, demonstrating that the scales can detect differences between healthy and less healthy children. [27, 30, 31] The studied patients were compared with age appropriate normative data using non-parametric tests and effects sizes. Example of question in HRQoL questionnaire. Numbers between brackets refer to the values resulting in the HRQoL scores. The TAPQOL-PF assesses the child's functioning on 43 items in 12 domains: sleeping, appetite, lungs, stomach, skin, motor functioning, liveliness (together physical functioning), problem behavior, anxiety, positive mood (together emotional functioning), communication (cognitive functioning), and social functioning. Scales that measure motor functioning, social functioning and communication are applicable only to children 1.5 years and older. Patient characteristics were obtained from medical records and the Patient Data Management System. Data analysis was done with the Statistical Package for Social Sciences (SPSS), Windows version 11.5. Before conducting the final analyses several preparation analyses were conducted: (1) Scales were constructed and missing data imputed on the basis of the guidelines of the questionnaires used; (2) descriptive statistics (Mann-Whitney and Chi-square tests) were used to describe the patient characteristics of the participants and non-participants; (3) non-parametric tests, (one sample sign-test or binomial test if median was equal to maximum), were performed to test whether the median or the binomial distribution of the several HRQoL-scales scores of the patients differed from the normative data available; (4) effect sizes (d) were calculated by dividing the difference in mean scores between the patients and the normative group by the standard deviation of the scores in the normative group. According to Cohen, effect sizes of about 0.2 were considered to be small, effect sizes of about 0.5 to be moderate, and effect sizes of about 0.8 to be large ; (5) all above mentioned analyses were performed for the whole group of participants (completed questionnaires 3 and/or 9 months after discharge); (6) paired t-tests were performed for the group that completed both questionnaires, to test for differences over time. A significance level of p < 0.005 was used in all tests to compensate for multiple testing. Patients' self-reports were used for analysis unless the self-report was not available due to the young age of the patient. 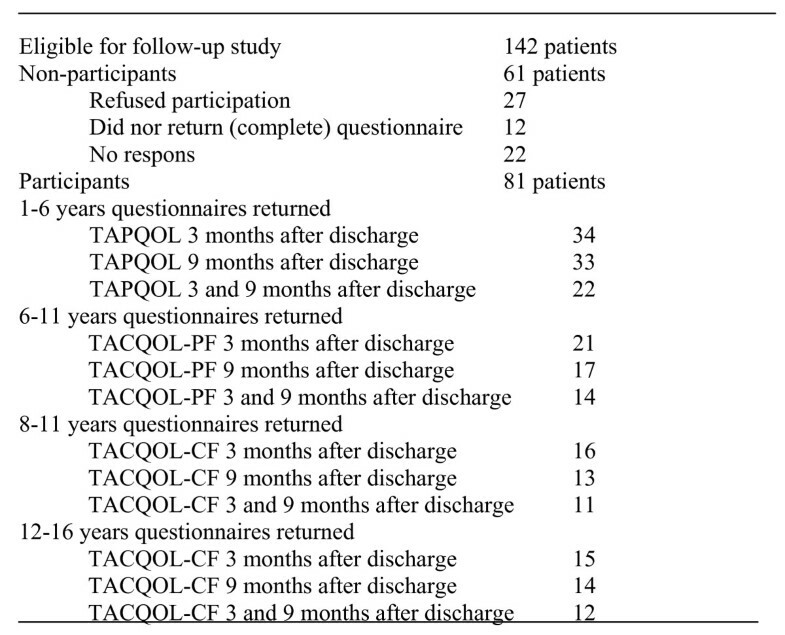 Separate analyses were conducted for (1) patients aged 1–5 years, using the TAPQOL-PF, (2) patients aged 6–11 years, using the TACQOL-PF, (3) patients aged 8–11 years, using the TACQOL-CF for children, and (4) patients aged 12–15 years, using the TACQOL-CF for adolescents. We decided to report all age groups despite small numbers, because the results in the different age groups were comparable. A total of 142 patients were eligible for participation in this part of the study. Twenty-seven refused participation (for geographical reasons or no interest), 12 said that they would like to participate but never returned their questionnaires or did not complete the full questionnaire; 22 families did not respond at all. Of 81 children either the children or their parents completed one or both questionnaires. The response rate is 57%. Thirty-one and 27 children completed questionnaires respectively three and nine months after discharge; 55 and 50 parents completed questionnaires respectively three and nine months after discharge. Twenty-three children and 36 parents completed questionnaires at both moments. (Figure 2) Statistically significant differences were found between participants and non-participants with respect to length of stay in the PICU. Fourteen participants and no non-participants had lengths of stay in the PICU of longer than 21 days. (Table 1). Participants and non-participants. Numbers of participants that completed the different questionnaires at 3 and 9 months after discharge and numbers of non-participants. * p < 0.005 whole group versus normative data. In the parents and children that completed both questionnaires, no statistically significant differences were found over time, indicating that HRQoL did not change from three to nine months after discharge. This is one of the first studies to describe HRQoL of children after a PICU experience using validated and reliable instruments. In all age groups, except for 8–12 year old children statistically significant differences with the normative population were found on a number of domains. The parents of 1–6 year old children reported statistically significant lower scores on lung problems and liveliness; and statistically significant higher scores on emotional domains like problem behaviour and appetite. The parents of 6–12 year old children and the 12–15 year old children scored statistically significant lower on motor functioning. In the children and parents that completed questionnaires three and nine months after discharge no statistically significant differences were found over time. However, almost all differences with the healthy Dutch population disappeared after nine months, except for worse motor functioning in almost all age groups and more lung problems, worse positive mood and worse liveliness in 1–6 year old children. Effect sizes (d) were calculated to assess the magnitude of differences in mean scores between the patient sample and the normative population. In all evaluated groups moderate and large effect sizes were found on more HRQoL domains than statistically significant differences were found. At three months after discharge, effect size calculation indicated worse HRQoL on physical, social and emotional domains compared to the normative population. At nine months after discharge most effect sizes decreased, indicating improvement of HRQoL, except for motor functioning, positive mood and liveliness in 1–6 year old children. Probably statistically significant differences were not found due to the small number of evaluated patients in the different age groups. Despite the lack of statistically significant differences, changes in effect size suggest that several domains of HRQoL are decreased at three months after discharge and improve over time. In the 1–6 year old children large and moderate effect sizes are found nine months after discharge in four domains: more lung problems, worse motor functioning, worse positive mood and worse liveliness. Apparently, parents of these young children report more physical and emotional problems than parents of healthy peers. HRQoL questionnaires or other measures on psychosocial functioning should be used to clarify problems as they are experienced by parents after discharge. We think that this finding needs further research. It is important to notice that children and adolescents report more negative emotions compared to their healthy peers three months after discharge. Negative emotions included in the questionnaire are feelings of irritation or anger. Although the differences were not statistically significant we think that this finding needs further research. Surprisingly children and adolescents did not report a worse HRQoL for physical symptoms. (Table 4 and 5) Apparently children show physical recovery after PICU survival but the emotional impact may be substantial. A number of limitations to this study should be taken into account. First, a considerable number of children were lost due to non-response and refusal. Other follow-up studies in the PICU have had similar response rates. Due to the small number of children in the different age groups statistically significant differences with the normative population were scarce. Second, of the patients that participated an even smaller number fulfilled questionnaires at both moments. Possibly due to small numbers, we did not see effects over time. Third, we probably failed to see a number of patients whose parents were experiencing psychological problems, such as avoidance and refusal to come back to the hospital, a well known characteristic of Post Traumatic Stress Disorder. [12, 14, 38]Fourth, participants had a statistically significant longer stay in the PICU. Probably this is due to a small number of participants that were admitted longer than 21 days and therefore had more commitment to the PICU which might have influenced them to participate in the study. Fifth, we included a predominantly Caucasian Dutch population. The results of this study are not necessarily to be extrapolated to patients from other ethnic or cultural communities.Sixth, the results of this study are influenced by known limitations of the used questionnaires. The questionnaires have been described in manuals with appropriate normative populations. Cronbach's alpha's in all normative populations are moderate to good. For some scales reliability has been rather low, which may have been due to the low prevalence and variance of problems in the general population sample. The questionnaires are designed primarily for research purposes and focus mainly on data aggregated on the group level, for example in clinical trials, evaluative or descriptive studies. Thus, all scales can be used for group comparisons in a valid and reliable way. Finally, considering the small numbers of patients in the different age groups we have not been able to study the determinants of HRQoL. In future research it is important to pay attention to determinants of HRQoL of PICU survivors, to identify those most at risk for problems. In this small group of PICU survivors differences in HRQoL with the normative population exist three and nine months after discharge. Calculated effect sizes were smaller nine months after discharge. These changes suggest that HRQoL improves over time. Apparently PICU admission impacts HRQoL three and nine months after discharge. More research is necessary but we believe that HRQoL assessment should be incorporated in follow-up programs of PICU survivors. It should include (1) HRQoL evaluation, (2) evaluation of risk factors for decreased HRQoL and (3) support after discharge if needed. Because awareness of HRQoL consequences and physical sequelae could lead to changes in treatment during the acute phase, pediatric intensivists should be core members of PICU follow-up programs. HK drafted the manuscript, HK and MBB collected the data for this study, HK, MBB and APB contributed to the analysis and interpretation of data and wrote the manuscript, MAG designed the study, contributed to the interpretation of the data and critical revision of the manuscript. All authors read and approved the final version of the manuscript.